How I got this book: borrowed it from my friend Debby, as she was lucky enough to get an ARC! Goodreads summary: Paige Mahoney has escaped the brutal penal colony of Sheol I, but her problems have only just begun: many of the fugitives are still missing and she is the most wanted person in London. Ok, first off: have you read The Bone Season? If not, why not? Cause you should. You should probably stop what you're doing right now, including reading this post and go read it. Just go. Go and be blown away by the awesomeness of Samantha Shannon's writing. -While The Bone Season had a whole lot of info-dump in it (which I was ok with, because hello amazing worldbuilding! 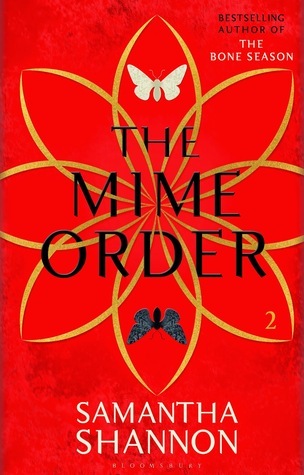 ), The Mime Order doesn't and it just builds and expands on this knowledge we've gathered in The Bone Season and it was AWESOME. I love re-immersing myself in this world and the characters and just gloriously revelling in Samantha Shannon's beautiful words. -Paige grows and grows as a character and she's just this strong, badass person who isn't afraid to make hard choices and fights for what she believes in and actually has a LOT of common sense and just, I love her ok? -WARDEN! I can go all caps on him because he's AMAZING and just LOVE! We read The Bone Season with our book club and all three of us who were there to discuss the book just went *sigh* after someone mentioned him. He's very swoonworthy and he becomes even more so in The Mime Order. Also, the chemistry he and Paige have is just wow. It is SO good. -THAT ENDING!!! Basically I have ALL THE FEELS and I had some serious book hangover after finishing this and even though I slightly saw it coming I was still like WHATTTT?? So go forth and covet this book. I'm DYING for the next one! WARDEN (mega heart eyes). I think he was possibly the best love interest I've read in a book last year. I can't wait to get my hands on The Mime Order. Great Post! I totally agree! I loved The Mime Order. I liked that there wasn't as much world-building so we can focus more on the plot and character development. Paige definitely grows so much in this books and I absolutely love her! AND THAT ENDING... So crazy! I am so insanely jealous you got your hands on an ARC!!! This is by far my most anticipated book of the entire year. I cannot wait! I really still need to read The Bone Season!!! I'm so behind!